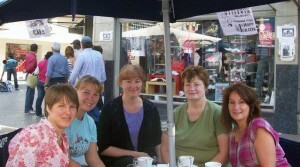 The Women of Grace Argentine GO team consisted of Laurie Carrick, Amanda Swain, Kelly Wilcoxson, Viki Rife, and Cindy McDonald. Sometimes it pays to go on a mission trip and NOT know the language. The Women of Grace GO team to Argentina saw an example of this a few weeks ago. One of the ministries of the missionary team in Corrientes, Argentina, is an English forum, allowing people to practice their language skills. But how do you identify the people who might be interested and have a skill level that will make it possible to participate in the forum? The GO team, consisting of Amanda Swain, Laurie Carrick, Cindy McDonald, Kelly Wilcoxson and Viki Rife, was hoping to identify some additional participants for the forum planned for Saturday evening. On Monday morning, the team had the opportunity to participate in a scavenger hunt with the Kevin and Holly High’s children: Levi, Hannah, and Amelia. Hannah and Amelia took Viki Rife and Amanda Swain, both of whom could speak Spanish, to form a team. At the last minute Kelly Wilcoxson—not a Spanish speaker—also joined that team. They sat down to plan their strategy. One of the questions involved finding the date on a map in the area museum. They headed for the museum and started to look for the right map. Kelly, not knowing the language, was wandering around looking at the museum pieces. The curator came up to her and asked her something. She told him, “No español.” He went to the back of the museum and came back with a young man who told her: “You speak English? I will translate.” He started giving a tour of the museum to the team, explaining various points of interest. The team learned that he was just visiting the museum, waiting for a friend who never showed up. He was two months away from receiving his degree as an English teacher. He was very interested in participating in the English forum. The hand of God and His timing was so evident. The museum was not actually supposed to be the first stop in the scavenger hunt. If the curator had talked with any other member of the team, they would have answered him in Spanish and the team would never have met the aspiring English teacher. We are trusting that this contact was a divine appointment that will bear fruit in this young man’s life. Making contacts wasn’t the team’s only ministry. One of the greatest joys of the team was being able to encourage Alice Peacock and Kevin and Holly High and their children through spiritual conversations. Even a number of delays allowed us extra one-on-one time with members of the missionary team to hear their hearts and encourage them in their work. They are in an area where the forces of darkness are very evident. The “saints” people pray to include a dead gaucho (cowboy) and Saint Death, the Grim Reaper. Everywhere there are shrines and chapels, filled with offerings to seek the blessing of these objects of worship. The Women ‘s GO Team came home with a new vision of the need to pray against the darkness, and to rejoice that Jesus has been seated at the right hand of God in the heavenly realms, “far above all rule and authority, power and dominion, and every name that can be invoked, not only in the present age but also in the one to come” (Eph. 1:21). This story first appeared in the September 30, 2013, issue of GraceConnect eNews. To subscribe to the newsletter, click on the box in the right column of this page.